Just about every Friday, I make two loaves of challah. I started with other people’s recipes, but adapted them over time to find one that works for me. It uses honey, of course! Honey is marvelous in baked goods, not only for its sweetening power (honey is sweeter than sugar, so you can use less), but also because honey attracts moisture. 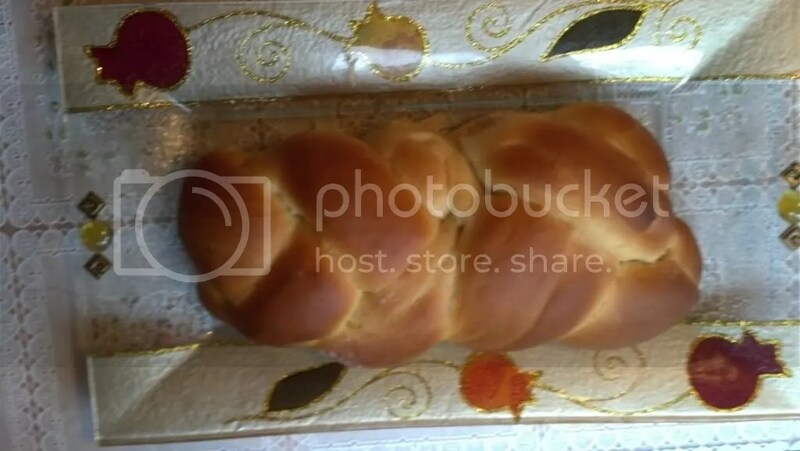 This makes it marvelous for your skin–and for your challah! Using honey means your baked goods won’t dry out nearly as quickly as they will if you use sugar. Granted, my challah rarely lasts in this house more than a couple of days, but it will stay fresh for several days, thanks to the honey. And this is an easy bread to make. The steps take about a half hour total, plus the time you’re waiting for it to rise and bake. But the mixing and kneading is a snap. And the house smells fantastic! So–here’s my recipe. Of course, I expect you to make it with local honey, from me, or from another small, local beekeeper. None of that mass produced, overheated, over filtered stuff! Put yeast and warm water in a large mixing bowl. I use my mixer, but this can all be done by hand. Let the yeast proof, about five minutes. Add the remaining flour until the dough comes away from the sides of the bowl. Turn out onto a floured board and knead for about 5-8 minutes, until the dough is smooth and no longer sticky. You can also do this step in your mixer, with a dough hook. Place in greased bowl, turn to cover with oil, cover bowl, and let rise in a warm place until doubled, about an hour and a half. Or refrigerate overnight. Next, punch down, and knead for about 5 minutes. If you have time, you can let it rise in the bowl again, or go right to braiding (I never have time for a third rise). Divide the dough into six even pieces, roll them into long strands, and braid three together to form two loves. Dont be shy. As you can tell from the picture, my braiding isn’t great, but that doesn’t change the taste! Places the loaves on a greased pan (or lined with a silicone mat), cover with plastic wrap, and let rise for a second (or third) time, about an hour and half. Optionally paint with beaten egg for a glossy shine, and sprinkle with sesame or poppy seeds. Or both. You can also incorporate raisins in the dough. Bake at 350F for 15 minutes, then turn the pan to bake evenly. Bake another 10, checking for doneness by tapping loaf on the bottom. It should sound hollow. This bread is rich and a little sweet, and any leftovers, should you be fortunate enough to have them, make a great bread pudding or french toast.